AARP stands for the American Association of Retired Persons which is a non-profit organization. Its aim is to give opportunities and support to senior citizens. 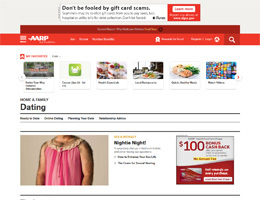 Founded in 1958, AARP has become an interest group for the whole world now. With nearly 38 million members in the organization (many of them are into dating), AARP dating is certainly one of the best senior dating sites in the world. Apart from online dating services, AARP also offers other relevant services/information such as health, travel, entertainment, and so on. AARP dating is a non-government online dating site which caters for the needs of senior singles. As a matter of fact, AARP dating’s service is beyond dating, as it also organizes events and gives information about other areas in life, i.e. health, retirement, travel, money, food and games. Therefore, it is a wonderful resource for senior citizens who have a passion for life. Probably because this site is not just for senior dating, it doesn’t have loads of fabulous features like other big senior dating websites; however, the quality of senior singles on AARP dating is probably higher in general. 12 months - $7.99 per month. Money-back guarantee: if you can’t find your ideal match on AARP dating, the site will return your money back to you. Note: If you are an AARP member, you will receive a 50% discount (AARP’s annual membership fee is $16). Search and chat: You can find your perfect match and talk to others (search functions include keyword, gender, age, location, height, beliefs, habits, hobbies, sexuality, politics, education, race, photos, kids, members with dates and only show members you have not contacted before). Play: Quick games help you decide which member you should contact. Post a date: Advertise your profile as well as your dating ideas. Daily recommendations: You will receive recommended dates every day. Messages: You can send and receive private text messages. Who has viewed you: You are able to see who has looked at your profile. Favorites: Have a list of your favorite members. Opened: See when other users open your messages. Meet up: You can arrange to meet other users in person. Earn points when you are online. AARP has a wealth of resources regarding dating, family, travel, finances, etc. As a result, it gives you more value than other senior dating websites. Its price is lower than most other senior dating sites. It offers a money-back guarantee, so you know your money won’t be wasted – if you are unable to find a perfect match through their service, they will return your money back to you. You can post a date idea: This is very unique, because you can post your date idea in public (a great conversation starter) and if someone likes your date idea, they can notify you. So you can have a look at their profile and decide if you want to contact them or not. Most members of AARP dating are from the United States, so if you are from other countries, such as Canada or the United Kingdom, maybe it’s harder for you to find someone in your location on AARP dating site. Some members are younger than you think, so if you are looking for someone older, probably this site will surprise you. However, if you don’t mind dating someone younger, then AARP dating is the right site for you. AARP dating is a senior dating site based in America. It provides dating services as well as other relevant information that is quite up-to-date. Many resources on this site are about inspiration from current news, so members can enjoy a lot of benefits. If you join AARP, not only will you receive a big discount when using its online dating service, but also get much help about managing your life after retirement. Therefore, we highly recommend AARP to you.